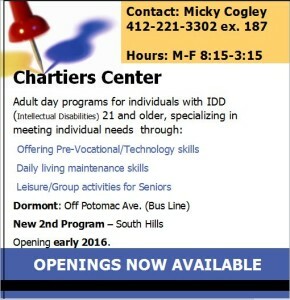 Chartiers provides programming for adults with intellectual disabilities. The Adult Training Facility is currently accepting referrals for the day program. For more information call Micky at 412 221-3302 ext.187. The Community Activities Program offers evening programming and the Family Living Program offers an alternative to residential services. Click on the box to the left to view more information on services for adults with intellectual disabilities.